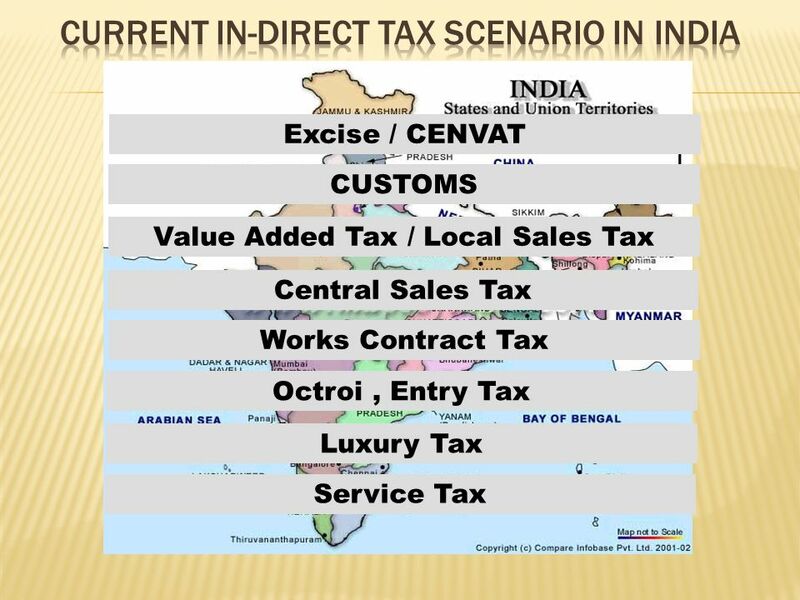 IMPACT OF INDIRECT TAXES ON CONSTRUCTION & BETTER TAX MANAGEMENT FOR PROJECT MGT EFFICIENCY C.R.RAGHAVENDRA, B.Com, FCA, LLB. 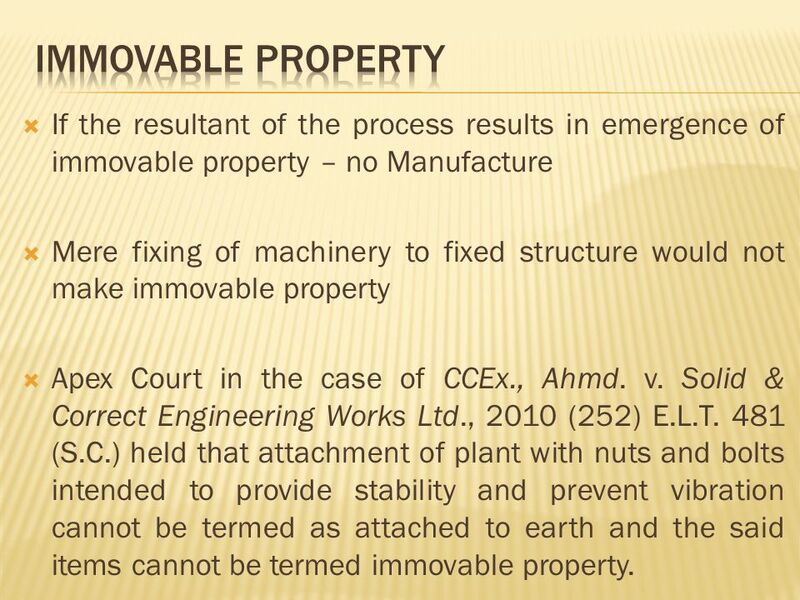 6 If the resultant of the process results in emergence of immovable property – no Manufacture Mere fixing of machinery to fixed structure would not make immovable property Apex Court in the case of CCEx., Ahmd. 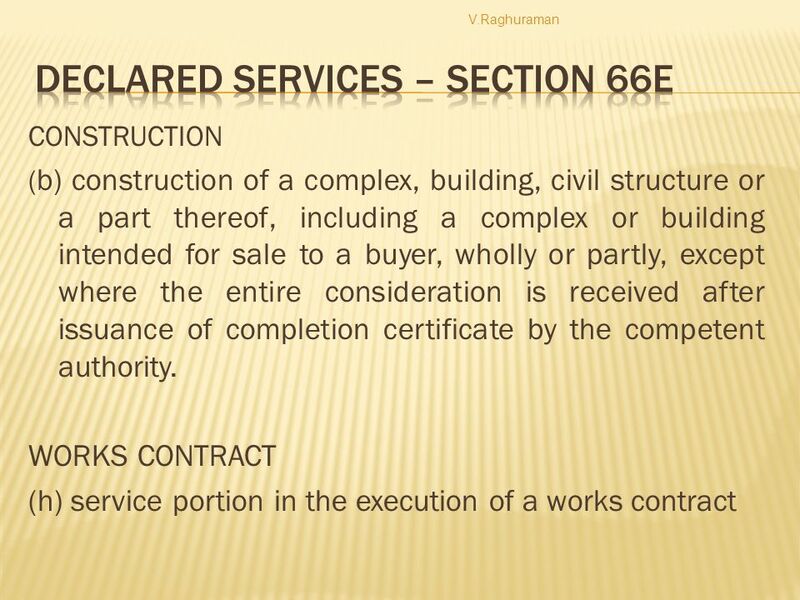 v. Solid & Correct Engineering Works Ltd., 2010 (252) E.L.T. 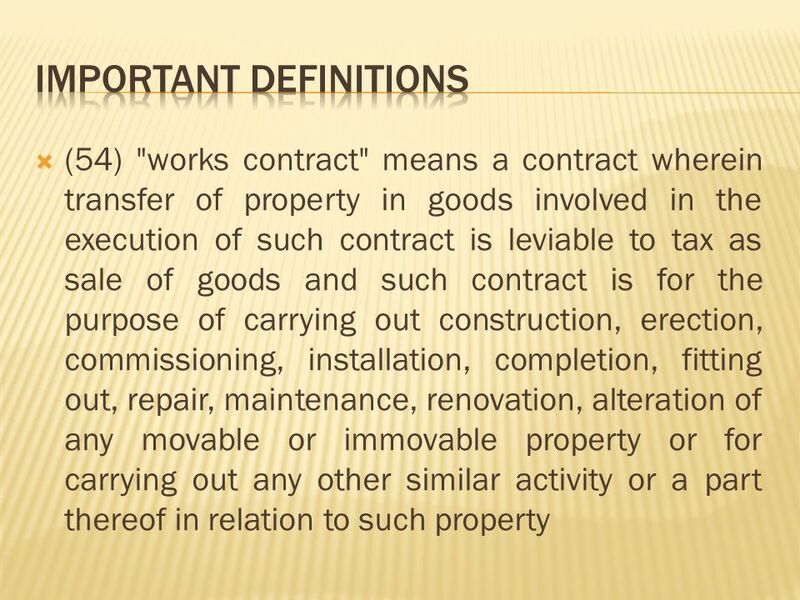 481 (S.C.) held that attachment of plant with nuts and bolts intended to provide stability and prevent vibration cannot be termed as attached to earth and the said items cannot be termed immovable property. 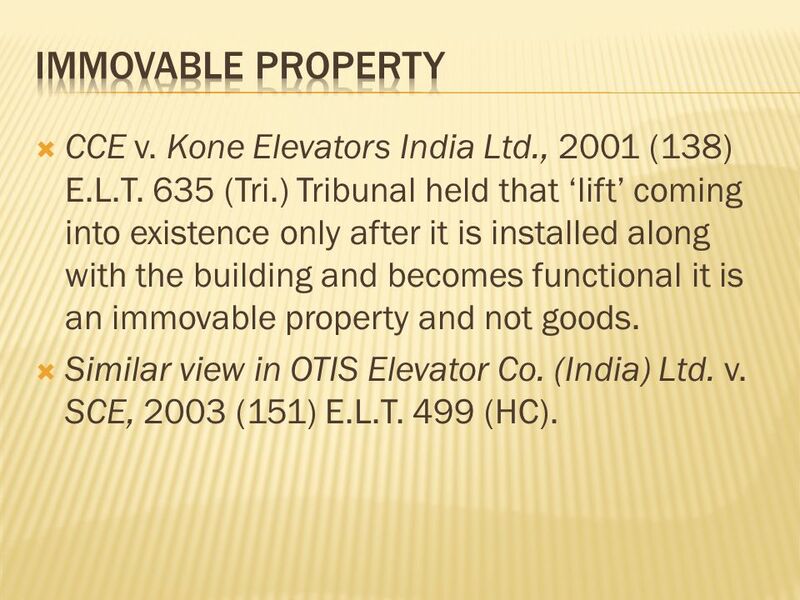 7 CCE v. Kone Elevators India Ltd., 2001 (138) E.L.T. 635 (Tri.) 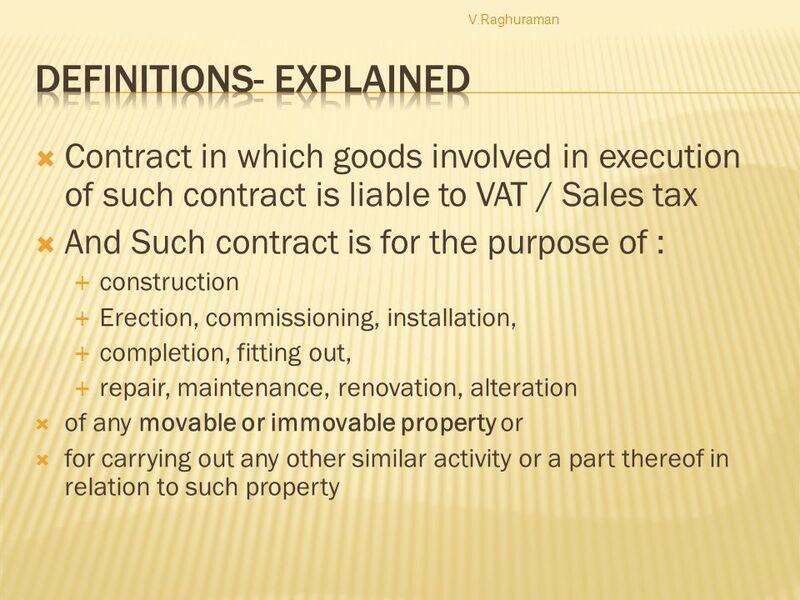 Tribunal held that lift coming into existence only after it is installed along with the building and becomes functional it is an immovable property and not goods. 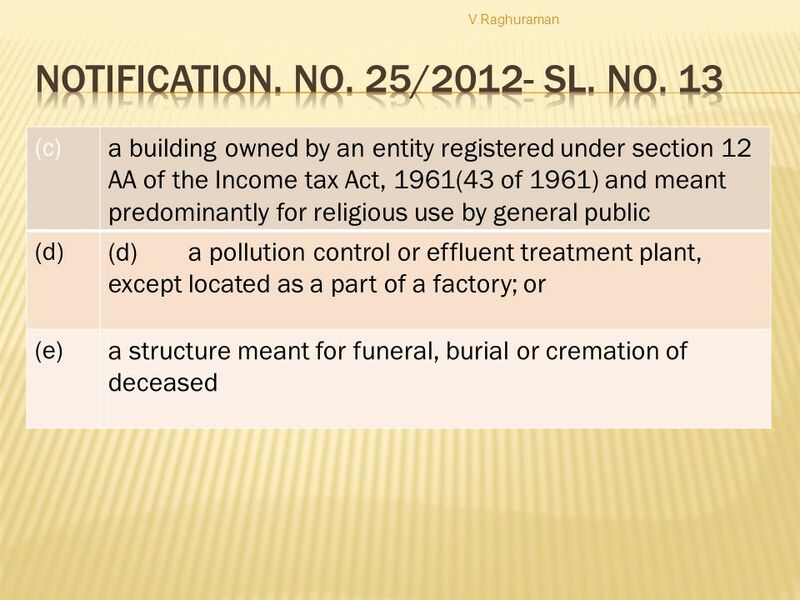 Similar view in OTIS Elevator Co. (India) Ltd. v. SCE, 2003 (151) E.L.T. 499 (HC). 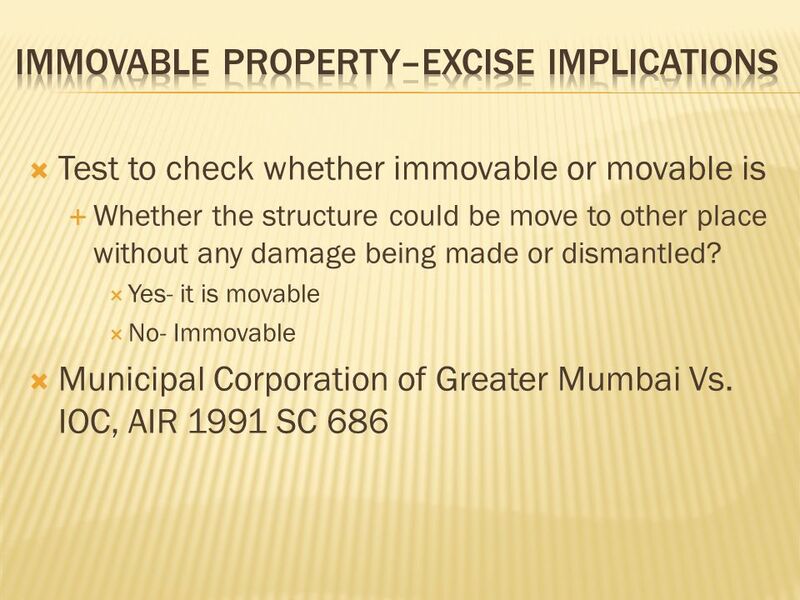 8 Any activity which results in immovable property cannot be subjected to excise. 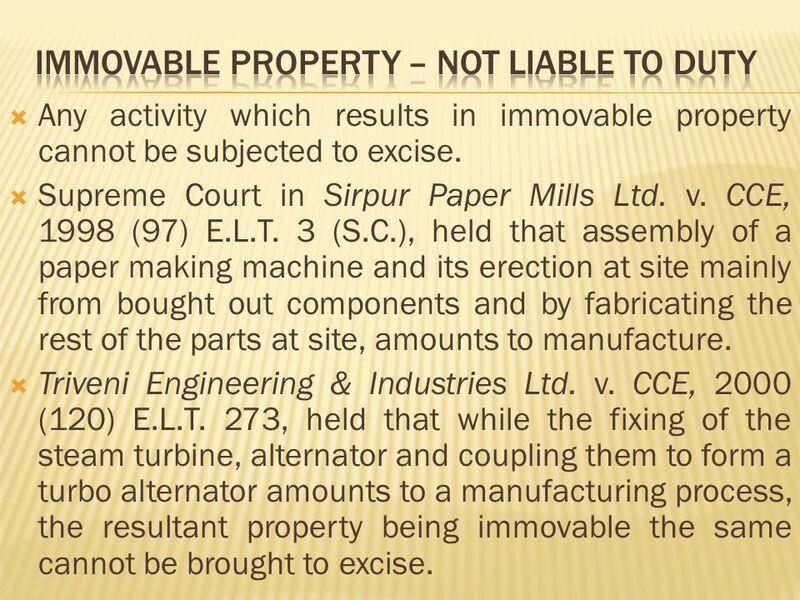 Supreme Court in Sirpur Paper Mills Ltd. v. CCE, 1998 (97) E.L.T. 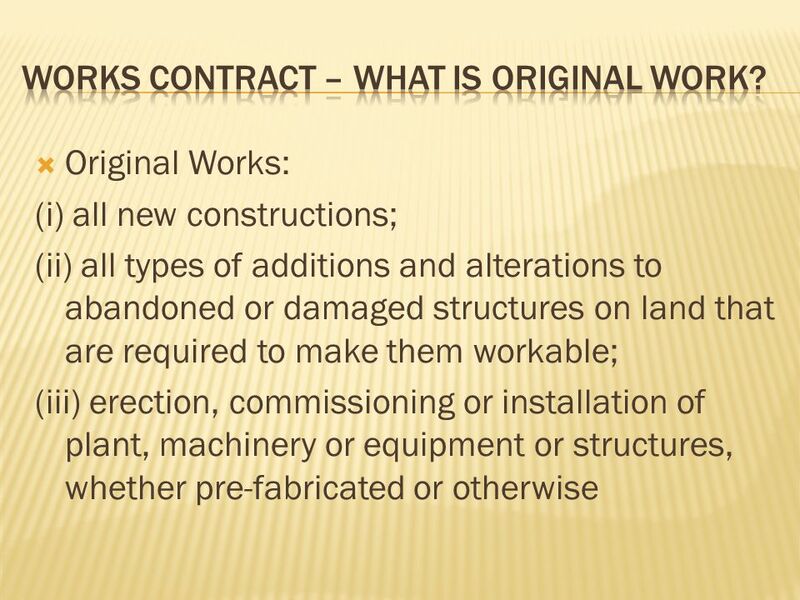 3 (S.C.), held that assembly of a paper making machine and its erection at site mainly from bought out components and by fabricating the rest of the parts at site, amounts to manufacture. 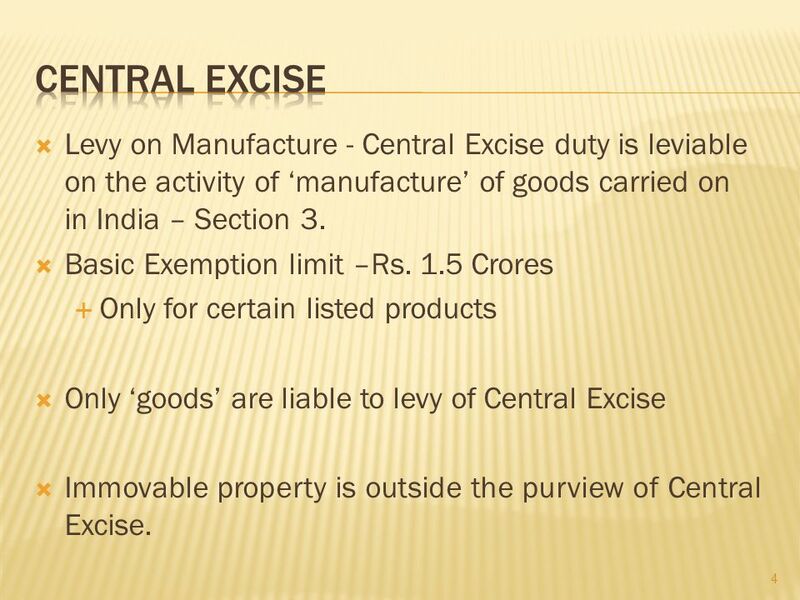 Triveni Engineering & Industries Ltd. v. CCE, 2000 (120) E.L.T. 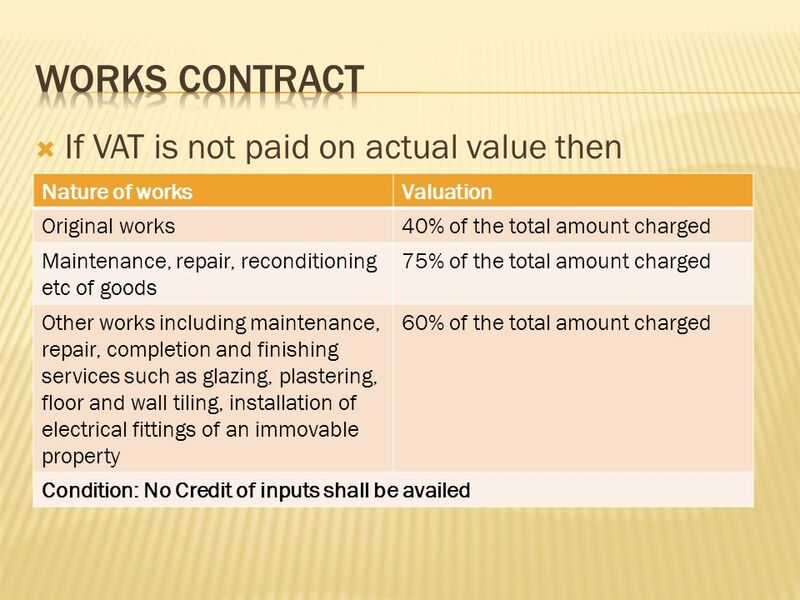 273, held that while the fixing of the steam turbine, alternator and coupling them to form a turbo alternator amounts to a manufacturing process, the resultant property being immovable the same cannot be brought to excise. 9 In Craft Interiors Pvt. 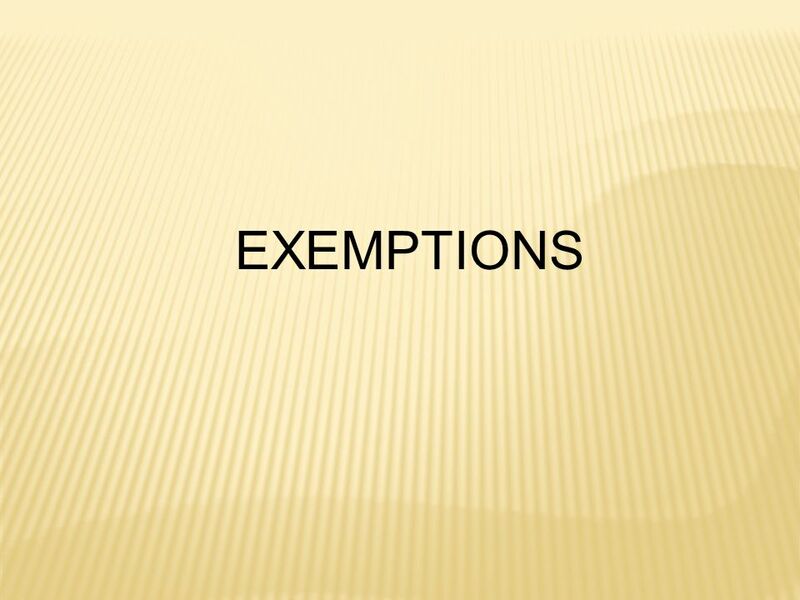 Ltd. v. CCE, 2006 (203) E.L.T. 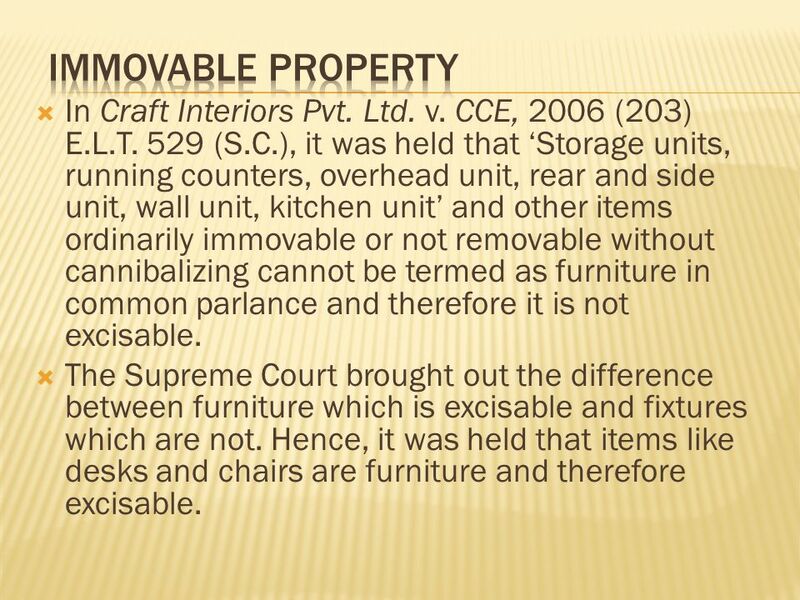 529 (S.C.), it was held that Storage units, running counters, overhead unit, rear and side unit, wall unit, kitchen unit and other items ordinarily immovable or not removable without cannibalizing cannot be termed as furniture in common parlance and therefore it is not excisable. 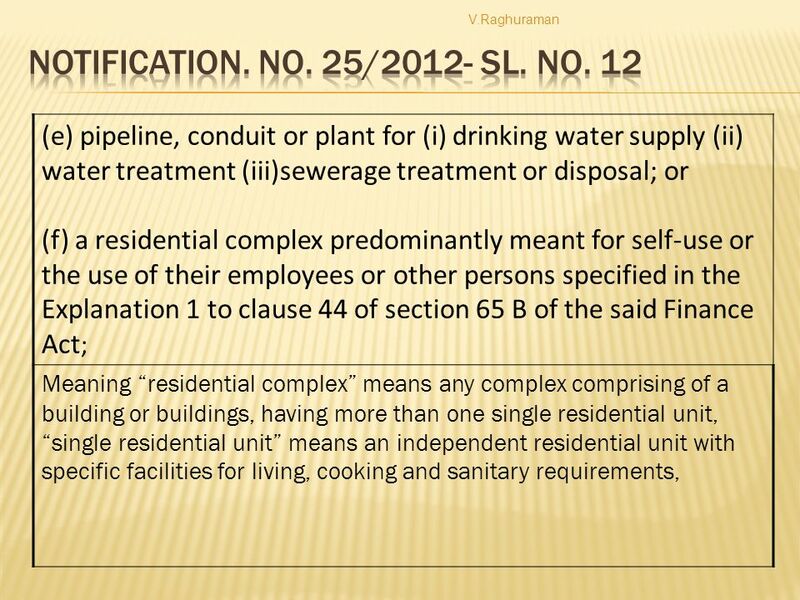 The Supreme Court brought out the difference between furniture which is excisable and fixtures which are not. 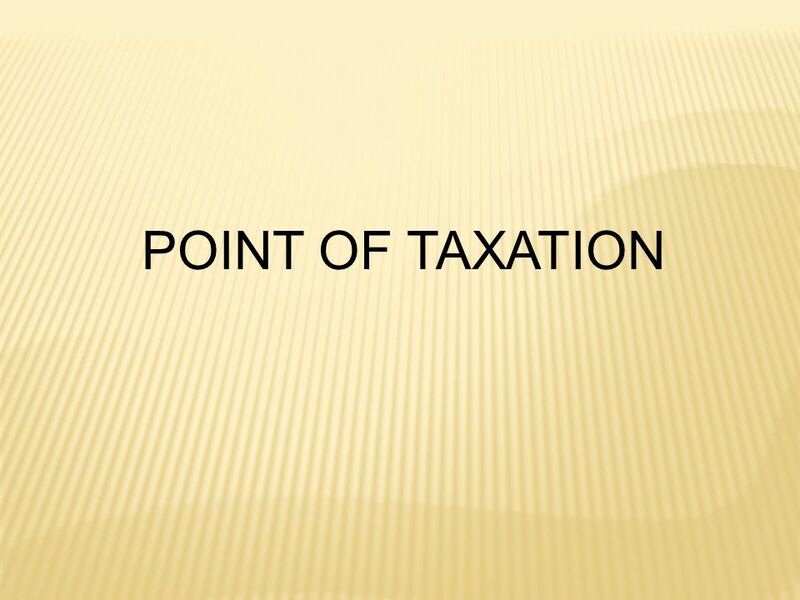 Hence, it was held that items like desks and chairs are furniture and therefore excisable. 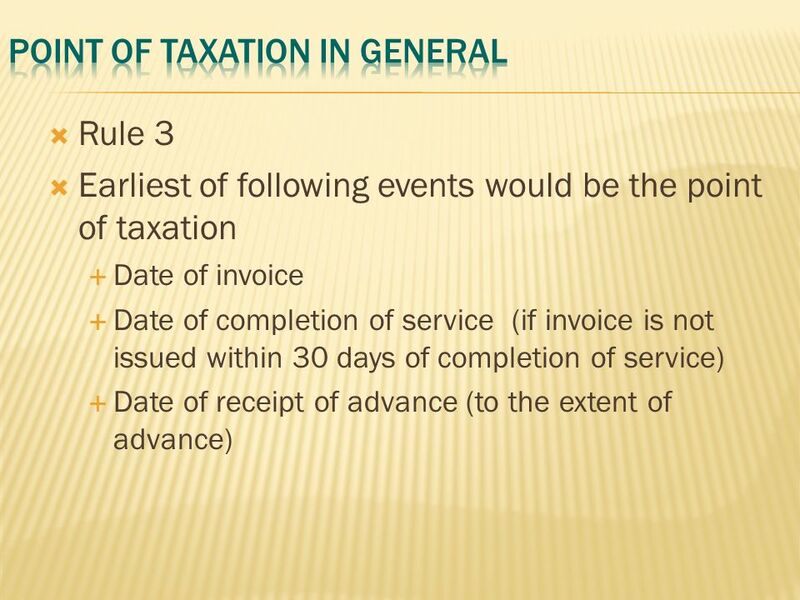 12 All activities covered under the definition of service would be liable to service tax. 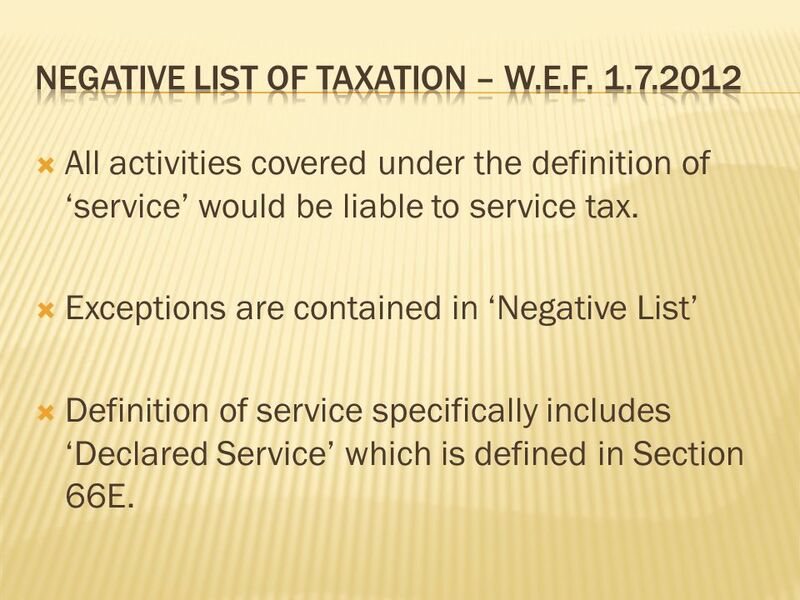 Exceptions are contained in Negative List Definition of service specifically includes Declared Service which is defined in Section 66E. 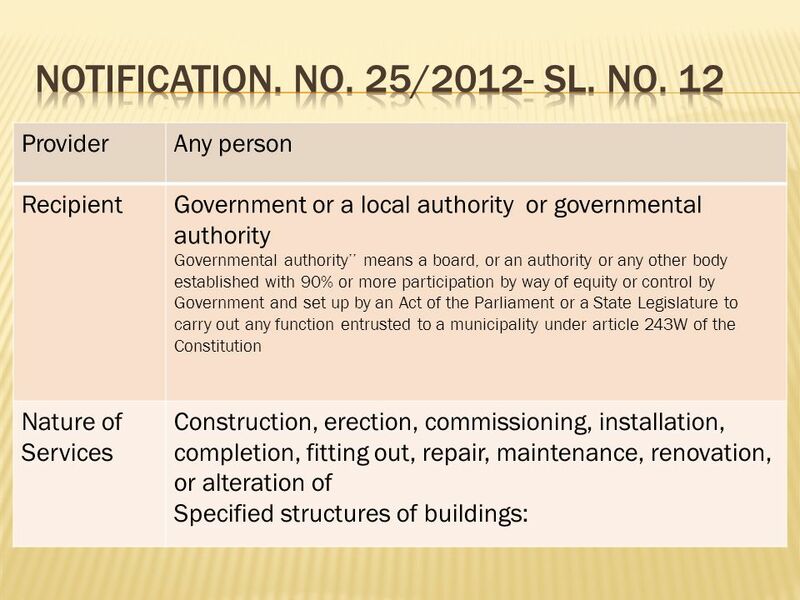 27 Joint Development Agreements – Whether construction of land owners share is liable to service tax? 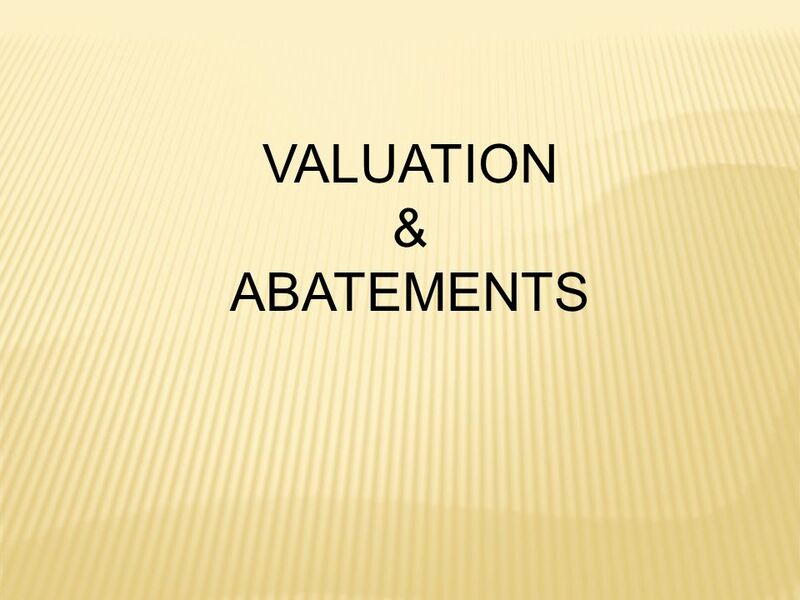 Whether developmental rights itself can be termed as immovable property? 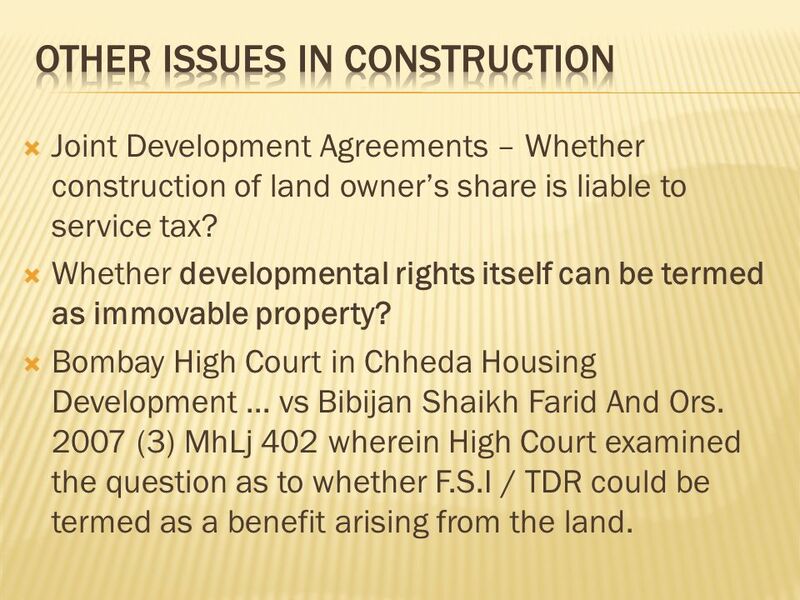 Bombay High Court in Chheda Housing Development... vs Bibijan Shaikh Farid And Ors. 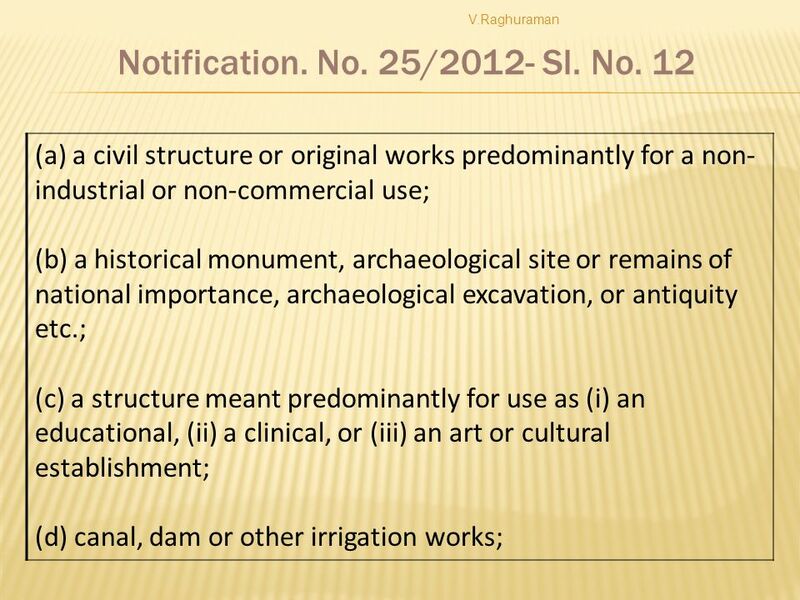 2007 (3) MhLj 402 wherein High Court examined the question as to whether F.S.I / TDR could be termed as a benefit arising from the land. 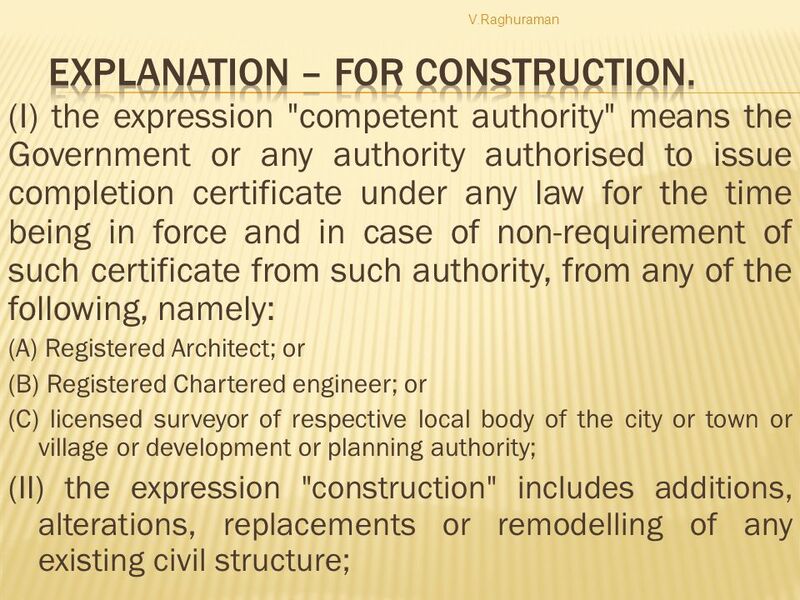 40 Whether developer who outsources the work completely is said to be a works contractor? 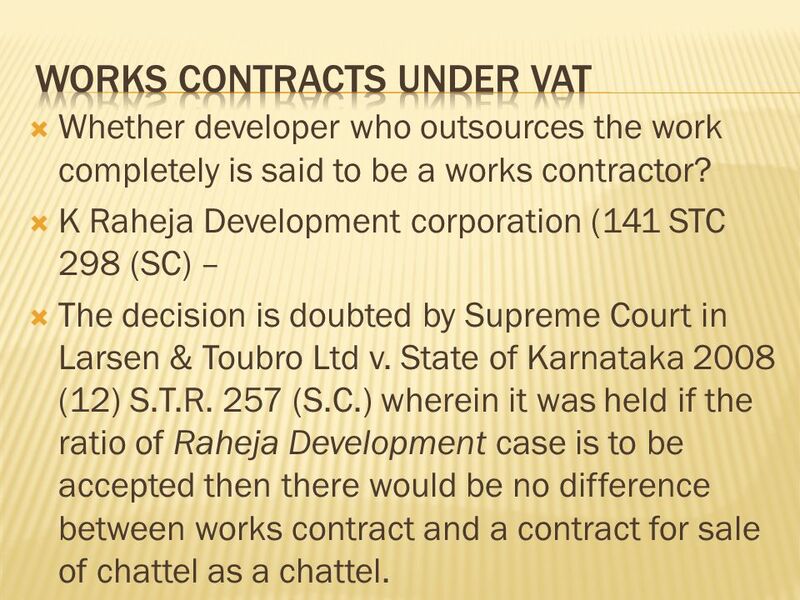 K Raheja Development corporation (141 STC 298 (SC) – The decision is doubted by Supreme Court in Larsen & Toubro Ltd v. State of Karnataka 2008 (12) S.T.R. 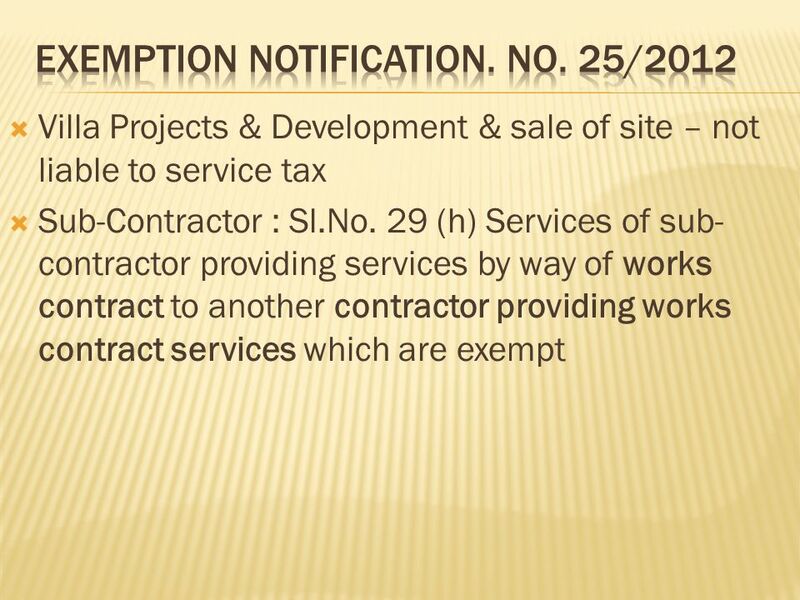 257 (S.C.) wherein it was held if the ratio of Raheja Development case is to be accepted then there would be no difference between works contract and a contract for sale of chattel as a chattel. 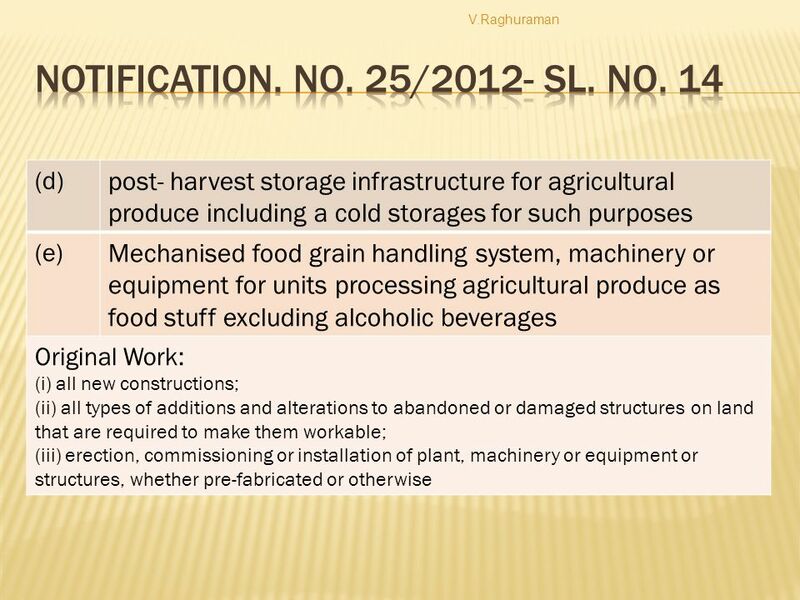 41 Email id : raghavendra@rceglobal.comraghavendra@rceglobal.com Contact: 94482 07163 C.R.RAGHAVENDRA B.Com, FCA, LLB, M/s. 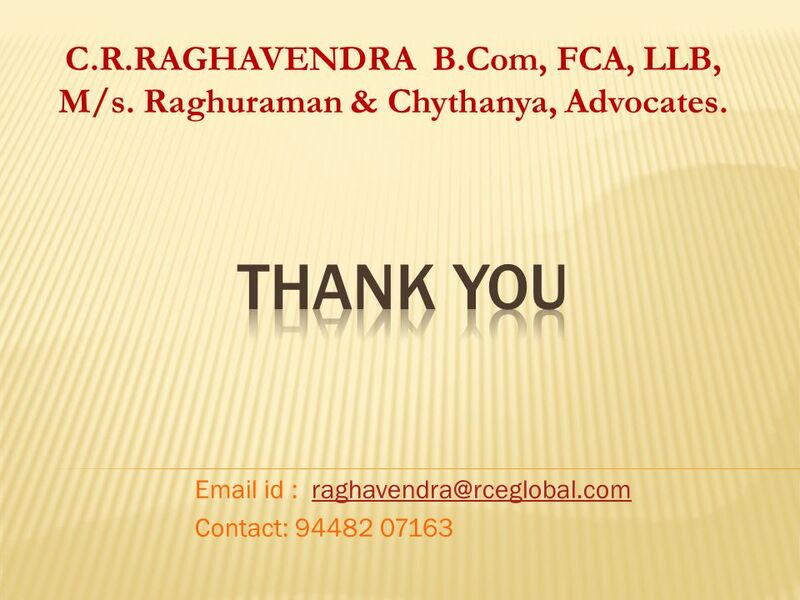 Raghuraman & Chythanya, Advocates. 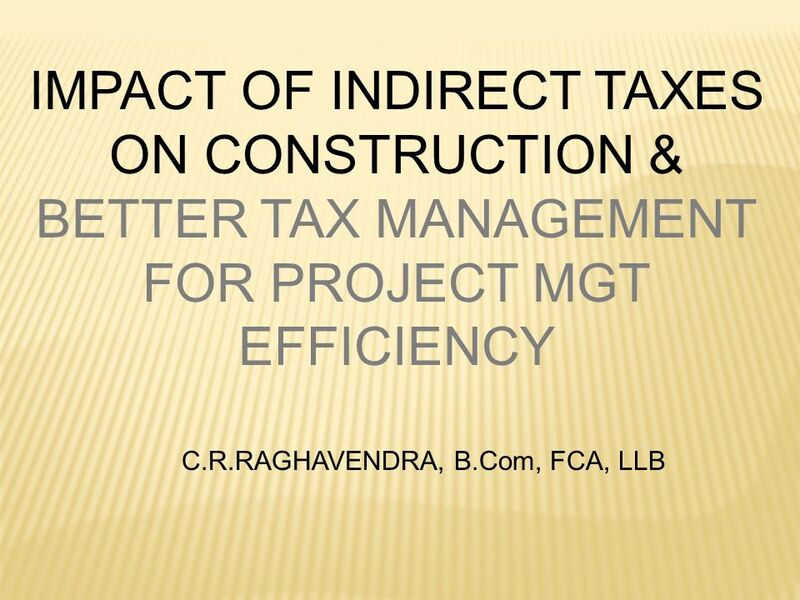 Download ppt "IMPACT OF INDIRECT TAXES ON CONSTRUCTION & BETTER TAX MANAGEMENT FOR PROJECT MGT EFFICIENCY C.R.RAGHAVENDRA, B.Com, FCA, LLB." 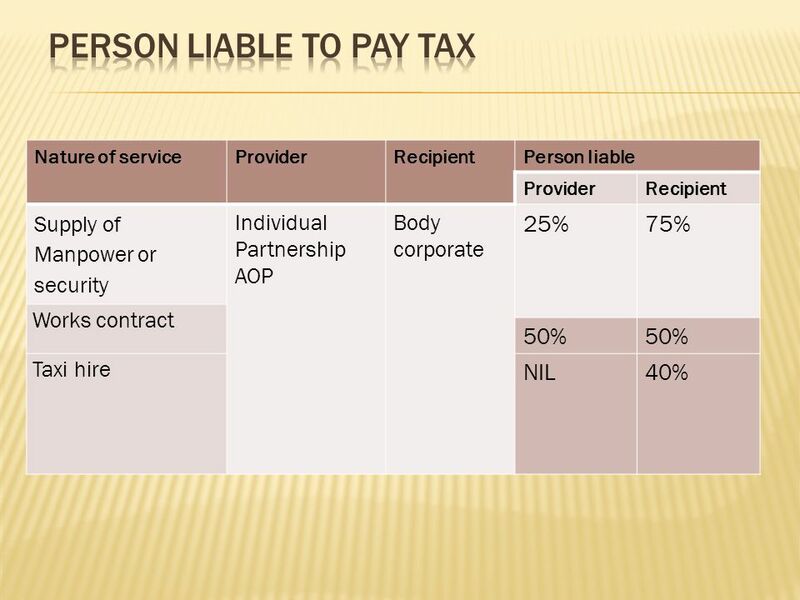 SERVICE TAX LIABILITY UNDER REVERSE CHARGE MECHANISM CA KR RAMANKUTTY FCA KOCHI. 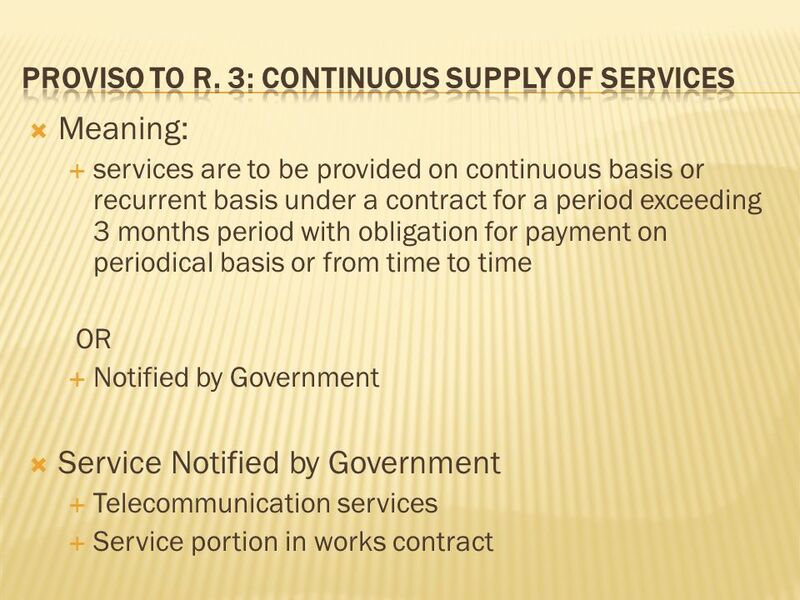 SERVICE Invoice Issued Rs. 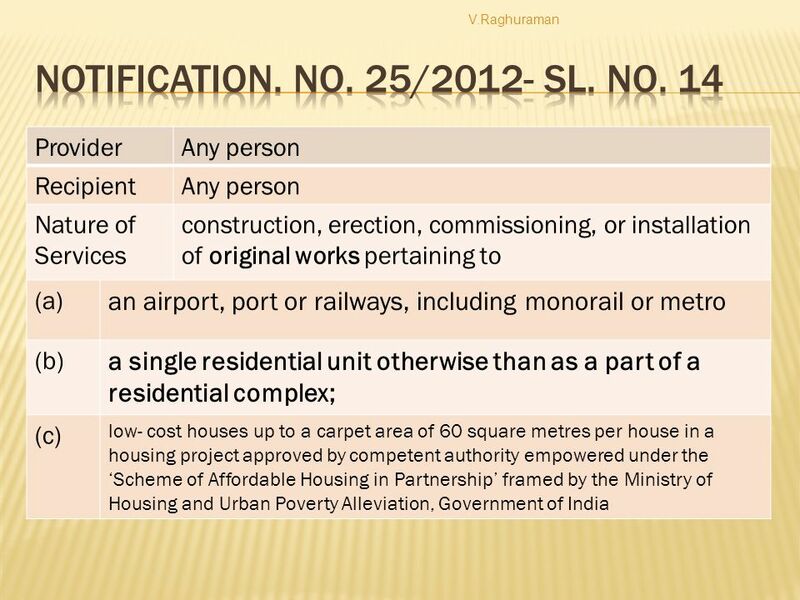 50,000/- + Rs. 5150(S.T.) 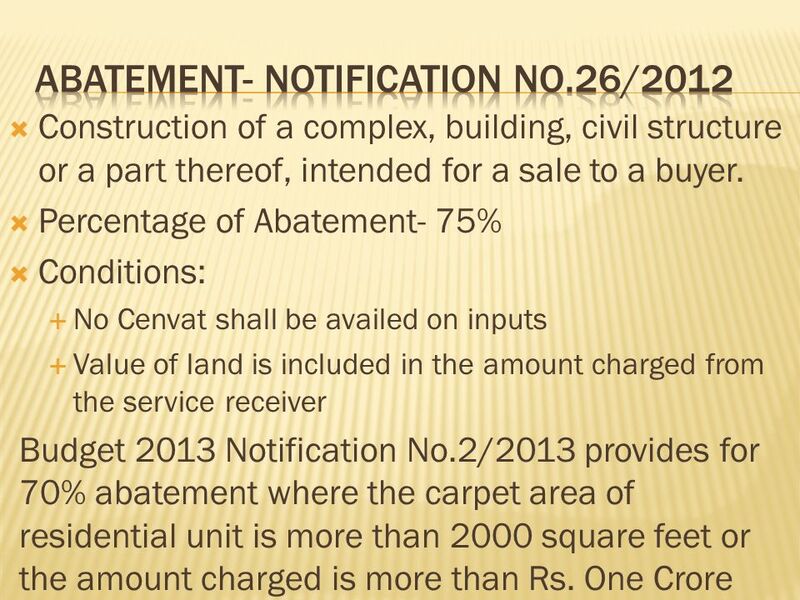 Invoice Issued Rs. 50,000/- + Rs. 5150(S.T.) 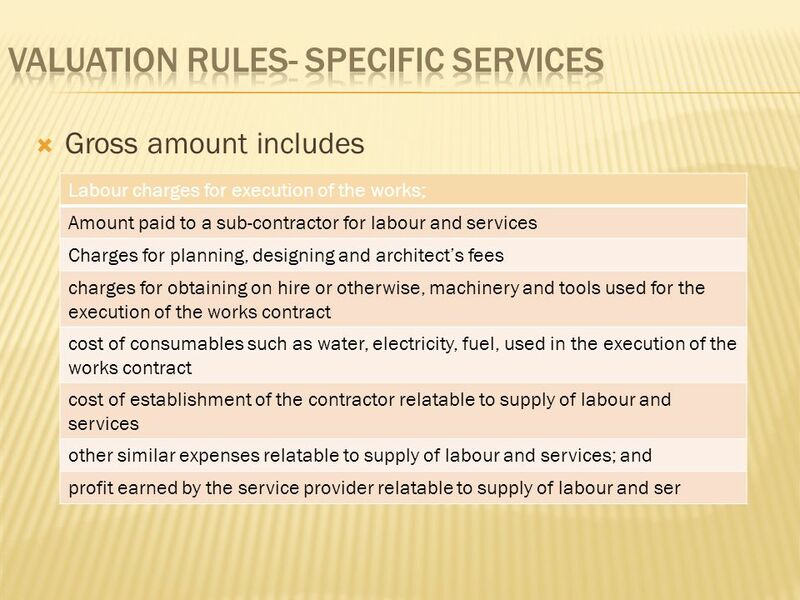 Invoice Issued Rs. 100,000/- + Rs. 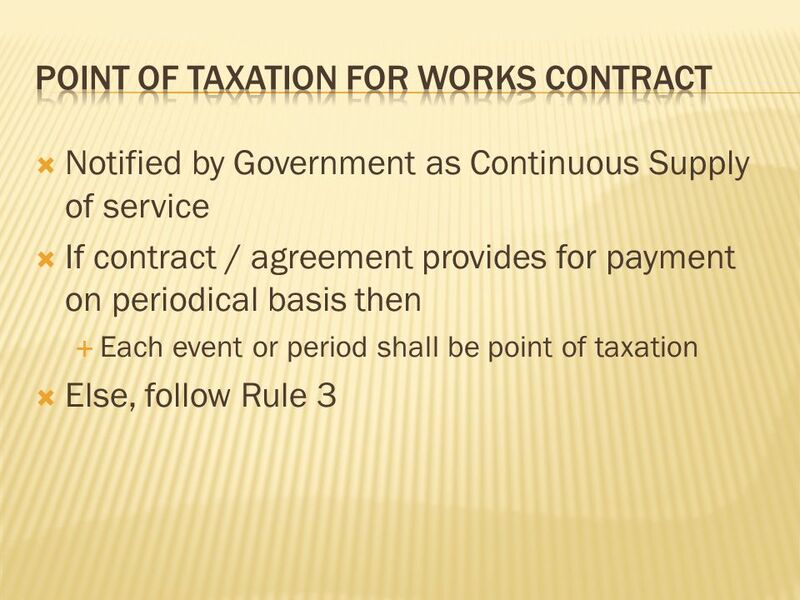 U.S. Department of Labor Wage and Hour Division Interaction of Labor Standards Statutes on Federal Government Contracts SCA interaction with DBA & PCA. 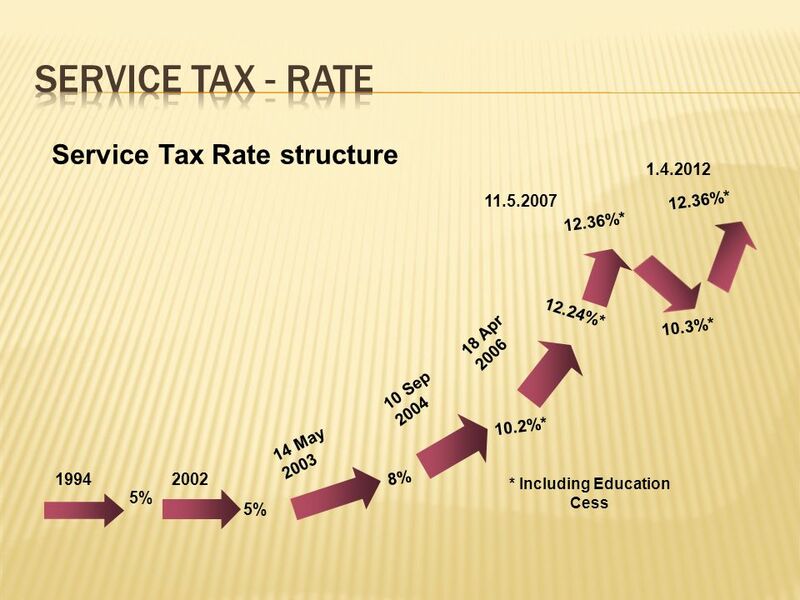 SERVICE TAX by g. natarajan, advocate swamy associates. 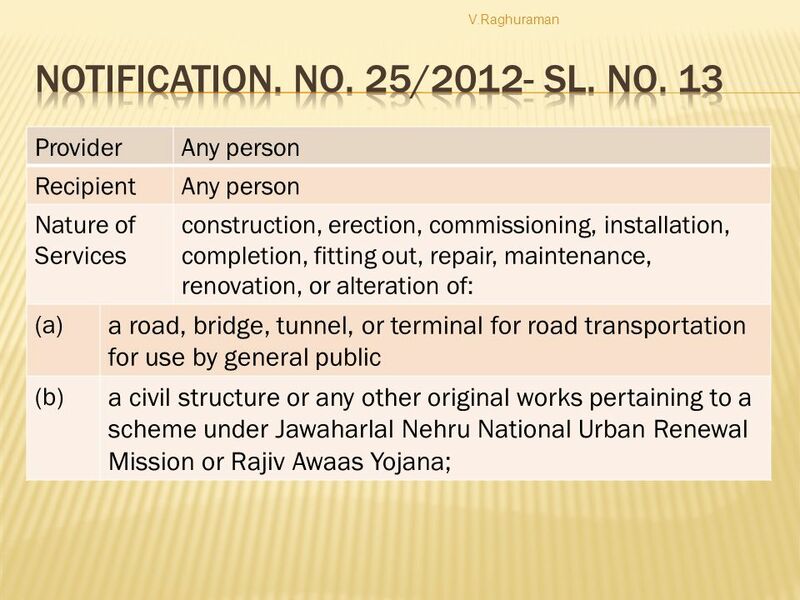 Index  Changes with immediate effect (from ). 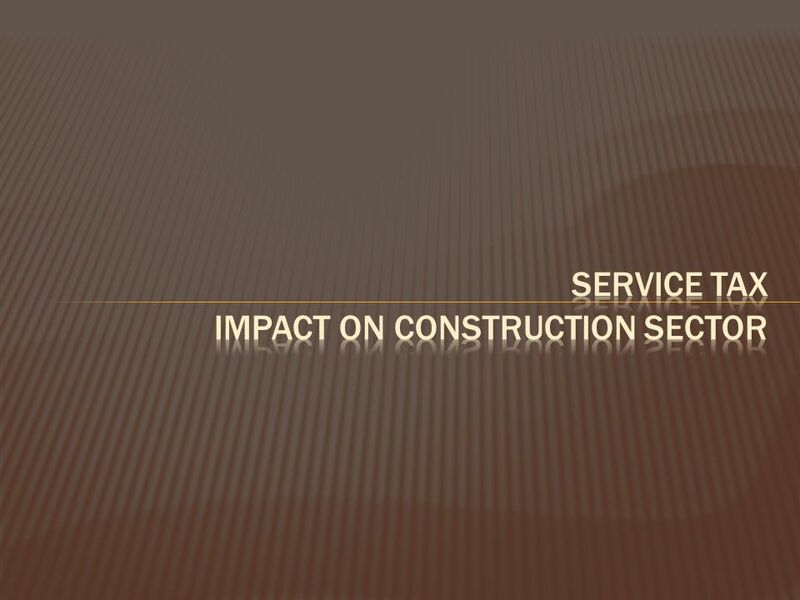  Changes effective from  Changes from the enactment of Finance Bill.  Changes. 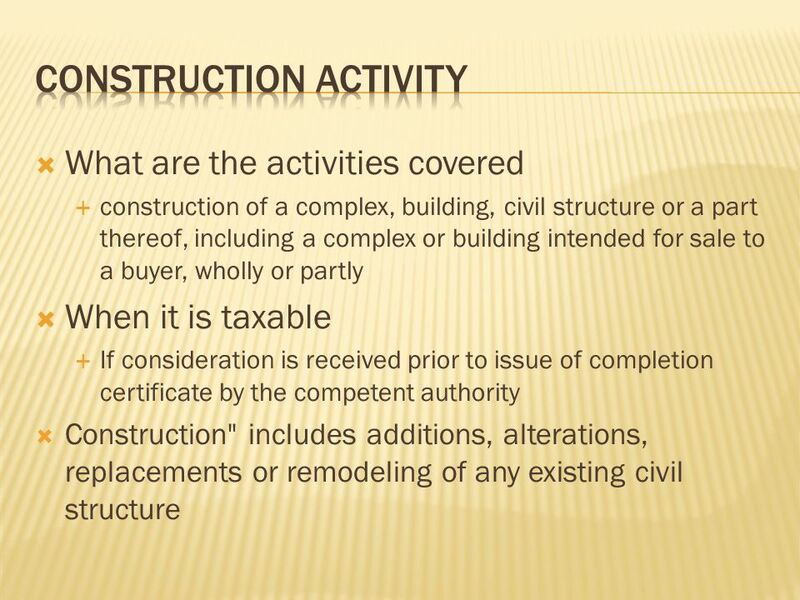 TAXATION ISSUES IN REAL ESTATE DEVELOPMENT TRANSACTIONS. 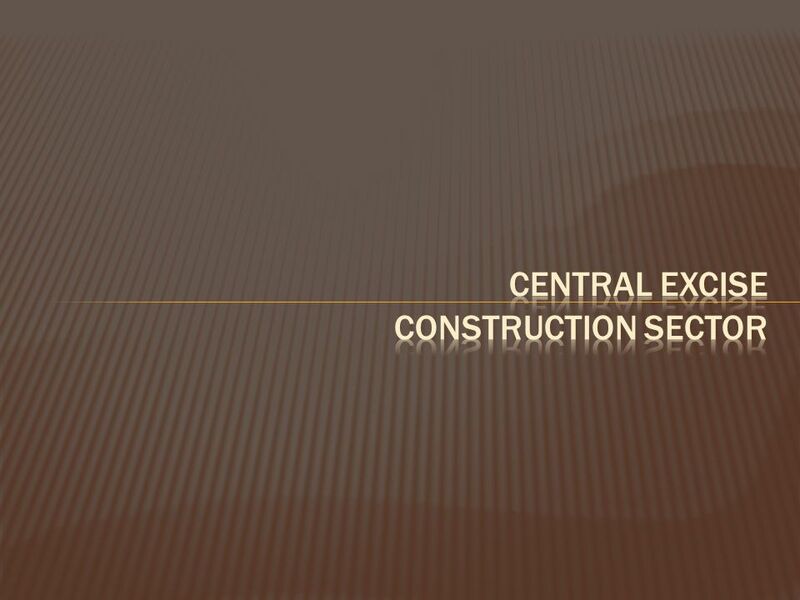 BARODA BRANCH OF WIRC OF ICAI December 13, Service as an Activity Anirudh Sonpal.